Cancer is a metabolic disease, there is little doubt to that statement. Cancer is rarely a genetic disease, though often discussed as such. What genetic changes that do exist in cancer are likely the result of the metabolic dysfunction and poor adaptation for survival that results from a hypoxic environment. This is the fourth article of a seven-part series by Nathan Goodyear, MD at An Oasis of Healing on the evidence and research on Vitamin C therapy for Cancer. If you missed the first three articles, you can go here for article number one and here for the second article and visit here for the third article to get caught up and read them in full. Dr. Lodi does not like the word disease, so let’s look at that word and see why. Disease is an early 14th-Century word that was more descriptive than diagnostic. According to the Etymology dictionary, the original meaning of the word disease meant discomfort, inconvenient, distress… The actual 2 root words are ‘dis’ (without) and ‘aise’ (ease) which gives the actual root meaning of disease as ‘without ease’. Interestingly, in the late 15th Century the meaning of the word disease evolved to mean ‘to make ill’. Since conventional medicine treatments are the 3rd leading cause of death, how can medicine not be called a means to make ill, a means to create dis “aise”, a disease itself. The scientific literature really leaves little evidence for any other conclusion, but that cancer is the result of poor adaptation to metabolic distress. In fact, cancer is the body’s attempt to adapt, though be it a poor attempt, to the presence of a low oxygen environment, oxidative stress, and poor energy production. In the short-term, this adaptation pays dividends for survival, but in the long-term, this adaptation leads to the survival of very dysfunctional cells and what we know as cancer. The genetic defects often found in cancer are more often the result of massive metabolic dysfunction, than a foundational genetic defect. In many ways, the genetic defects found in cancer are the effect of the extreme metabolic dysfunction in cancer rather than the cause of cancer. I have had the pleasure of speaking at numerous conferences including the same conference as Dr. Thomas N. Seyfried, the author of Cancer is a Metabolic Disease. Dr. Seyfried is extremely well published on the mechanisms of the dysfunctional metabolism of cancer. 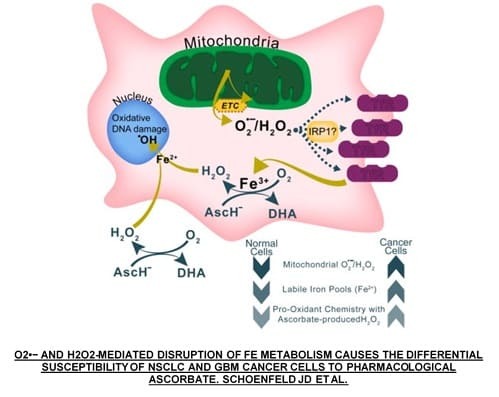 His 2015 article entitled Cancer as a mitochondrial metabolic disease, published in the Journal Frontiers In Cell and Developmental Biology, is a heavy, but very good read on the metabolic mechanisms behind cancer. In addition, Dr. Dominic P. D’Agostino at the University of South Florida spoke at the same conference on the use of the ketogenic diet in the management of metastatic cancer. Now, I have the opportunity to work with my good friend, Dr. Thomas Lodi, a pioneer in Integrative Oncology. These and other pillars in the cancer research community have helped to decipher the mechanisms behind the actions of IV vitamin C in cancer and apply them to clinical practice. The combination of the knowledge of cancer metabolism and the mechanism and use of IV vitamin C in cancer metabolism provide a targeted, lethal combination in the fight against cancer. To describe the mechanism of action of IV vitamin C in cancer, I need to get a little technical so please bear with me. Put on your thinking caps. Humans are one of several species that have lost the ability to make vitamin C, hence what vitamin C we have in our body comes through our diet and/or supplementation alone. In addition, the human body has very limited capacity to store vitamin C. This lack of productive capacity and lack of storage leaves most people with cancer with massive vitamin C deficiency in what I like to call metabolic scurvy. One of the benefits of vitamin C in the battle against cancer is that vitamin C looks just like glucose—sugar. Vitamin C is actually made from glucose by the enzyme gulonolactone oxidase. Humans lack this enzyme, which requires regular, continuous vitamin C from our diet. As concerning as this enzymatic deficiency can be, this deficiency provides a silver lining in the fight against cancer. Cancer thrives in the typical glucose-rich environment of the western American diet. The elimination of simple sugars, excessive carbohydrates, and high process foods from the diet will starve the cancer of its primary fuel source—glucose. In the low glucose state induced by targeted nutrition plans, vitamin C is readily taken up by the energy-starved cancer cells via the receptors SVCT1 and SVCT2 because of vitamin C’s resemblance to glucose. In this case, vitamin C is a stealthy, metabolic time bomb for cancer cells. This is why nutrition is as much a part of treatment at an Oasis of Healing as the IV therapies are. Back to the how of Vitamin C in cancer. The first key step, as I have discussed previously, is the pharmacologic dosing of vitamin C and not the physiologic dosing. Dosing vitamin C at levels that prevent scurvy will never achieve therapeutic anti-cancer effects. Vitamin C must be dosed as a medicine. This is a point that most physicians completely miss. It goes back to the pharmacokinetics that I have discussed previously; but then again, most physicians don’t pay attention to pharmacokinetics. Recent evidence points to the extracellular production of the Reactive Oxidative Species (ROS) superoxide anions O2- and then eventually H2O2 by pharmacologic dosing of vitamin C is what appears to precipitate the cascade of events that eventually results in cancer cell death. It is the intracellular effects of H2O2, however, that leads to oxidative damage via the increase in hydroxyl free radicals and eventual death of the cancer cell via overwhelming oxidative stress. An important point that needs to be made here: it is the altered energy cell metabolism of cancer cells i.e. aerobic glycolysis or “the Warburg effect” and the increased cell metabolic rate of the cancer cells that increases the baseline level of ROS species, which, in turn, increases the labile iron (Fe) pool (via an increase in the cellular uptake of Fe and a corresponding decrease in the elimination of Fe by the cancer cell), which provides the necessary environment and sensitizes the cancer cells for therapeutic vitamin C and resultant H2O2 to overwhelm the cancer cell with ROS. The image directly above highlights the proposed pathway and effects of vitamin C as well as the different effects in normal cells vs cancer cells as published in the recent article published by Schoenfeld JD et al in Cancer Cell. The exact mechanism of cell death has not been exactly determined and, in fact, is probably quite variable. Despite the exact mechanism of action known, recent studies and review articles have shown that the intracellular H2O2 interacts with elevated iron pools and/or elevated copper levels to produce hydroxyl free radicals to directly damage the DNA of the cancer cells, damage DNA repair proteins of the cancer cells, inhibition of cell growth cycle, up-regulation of the tumor suppressor gene p53, compromised energy production via damage to the cancer cells (mitochondria) energy powerhouse, and even modification of genetic expression via what is known as epigenetics. The pro-oxidant effect of H2O2 in cancer cells (discussed in another post) is the dagger in the heart of the cancer cell. 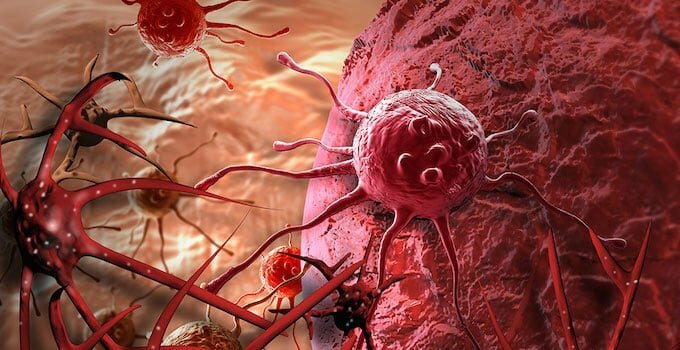 Cancer cells have limited catalase and glutathione peroxidase activity compared to healthy cells leaving cancer cells susceptible to the destructive oxidative effects of the Reactive Oxygen Species. These key enzymes are used by the cell to handle the oxidative effects of H2O2. These limited glutathione peroxidases and/or catalase levels and/or activity render the cancer cell vulnerable to the oxidative effects of H2O2 from pharmacologic vitamin C dosing. That is the science. Though the exact mechanism, down to every fine detail, of the effects of vitamin C on cancer cells, is not yet determined, the knowledge of the effects of vitamin C in cancer far exceeds that of many FDA approved drugs. If you ever have insomnia, read the package insert for the drugs sometime and you will often find the words, “exact mechanism of action not known”. Despite that statement, physicians prescribe and the public takes. The word insanity comes to mind. The history supports vitamin C, the volume of evidence supports vitamin C, the evidence supports the biochemistry effects of vitamin C, and finally, the thousands of patients with cancer that have benefited from vitamin C confirms the evidence. The only thing stopping physicians from using more vitamin C is simple ignorance, whether intentional or not. Now, you are informed. Take control of your journey in the defeat of cancer and the restoration of health.